How many more will Brian Rice poach from us in his search for fame?! Can we disown Brice from our history? Did we get a fee for him? They are a premier league club, they can afford it. I hope there are no more late departures, as it will leave us as short of players, and in the same state as we were before the window. I'm fine with this if it means we're bringing in a different type of striker. It would be very strange if we were left with just 2 strikers at the very moment that we've started playing 2 up front. As we are skint then I'm not surprised we took cash for Oakley, we are however left relying on White and Austin(if fit) as our senior strikers. Perhaps more game time for younger players! It's okay, we can put the pennies in the jar with the tv money. Easily the best of our strikers allowed to leave for peanuts no doubt. We might pass him on the way up. Hamilton are crap and this could well be the season they come down. A loss but also an opportunity for our two young home grown strikers to make more of an impression. Disappointing but not a disaster. Maybe not the best move for George as he could only get a few months in the premiership and then be back in the championship. The very fact we have allowed him to go means he wasnt in the longterm plans of Robbo as I wouldnt imagine we would have got a lot of money for him. Wish the lad well in his future career, maybe see him in the playoffs. Can’t say I’ve ever found myself thinking that Oakley is too good for this league and should be playing at a higher level. 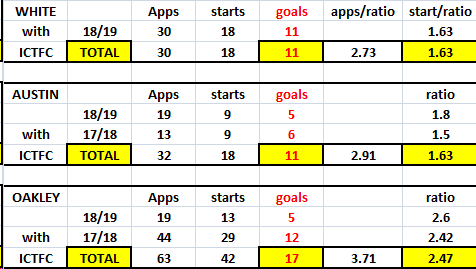 I've not been to many games this season but from what I saw last season I didn't think Oakley was that good a striker. He certainly wasn't the sort of striker who would fire you to the title in this league. He was also out of contract at the end of the season and if we thought he wasn't going to re-sign and isn't a starter then cashing in, even if it'll be pennies in the scheme of things, could be the right thing to do. He was a good contributor though and it leaves us with two senior strikers, one of whom is really injury prone. I'm cynical about the youth players - every post-match interview it seems we've got coaching staff talking about how good our youth players are but we never play any of them and have now signed a Hearts youth player who has gone straight into the first team. I understand some feel that Oakley was arguably the best striker out of the three senior ones at the club. but stats both in appearance and start ratios to goals scored present a different picture. I agree with ictchris and maybe it was the correct decision to cash in on him if he wasnt in Robbos plans going forward. Oh dear - Gorgeous George gone and, now the nerds find the %s to justify. Why? The ladies are bereft that gorgeous George is with Hamilton. Will the ladies follow Hamilton? Time will tell. A player like Oakley with his contract due to end in the summer would have been lucky to net us £10k. Even if they felt sorry for us and paid double that, howow desperate do we have to be for that to be a sum we couldn't turn down? So why hook Austin at Ayr ????? You would never fit in to the Hamilton Young Team. A deal was also on the cards earlier for Austin to go to Partick and storey coming to us. Looks like it's fallen through though. Why robbo wanting rid of two of our strikers? Dutd are supposed to have got Sow and with their other recruitment will make them significantly stronger now coupled with the strength of County I wouldn't be surprised if the ICT board are already cutting costs to plan for next year still in the championship.